Log on from wherever you are to view customer information and record notes (which will automatically display in your To Do List on the Dashboard). Search for customers and contact them straight from your Android smartphone, using your standard phone or email applications. Find your way to your customer’s offices using the map links. Process quotes and email these directly to your customers. To download this application, go to the Accounting website. Click on the Add-ons menu option. Scroll down until you see the Accounting on your Android Device section. Click on the Download for Smartphone button and install the application on you Android Smartphone. You can view your customer information on your iPhone. To download this application, go to the Accounting website. Click on the Add-ons menu option. Scroll down until you see the Accounting on the iPhone section. Click on the Download button and install this application on your iPhone. Log on from wherever you are for an up-to-date, bird’s eye view of your business. See your sales and purchases for the day and a yearly view of your sales – this year vs. last year. 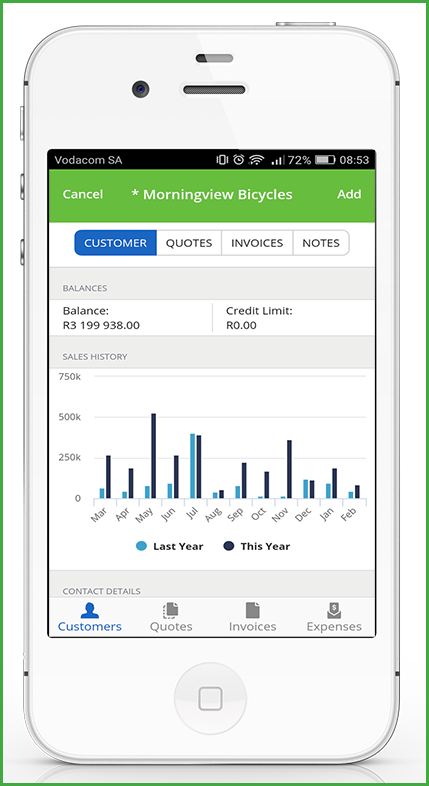 View up to date information on your customers, check your due and overdue tasks, process quotes and invoices, email these directly to your customers, and track your expenses – all on the go! The Windows Phone application is available on the Windows Phone Store. Please Note: This is for Windows Phone 8 only. © 2019, Sage Software, Inc. All Rights Reserved. Sage One is a registered trade mark of Sage.